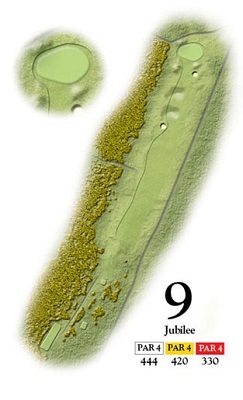 A fantastic Par 4, at 444 yards and stroke index 1 usually playing into the wind, there is only one fairway bunker which is normally out of range from the tee, however out of bounds is in play all the way along the right and gorse lines the left hand side making an accurate tee shot here essential. A long approach again to a shallow green with a narrow entry is required avoiding the bunker which sits away from the green edge. A four here is a great end to the front nine.